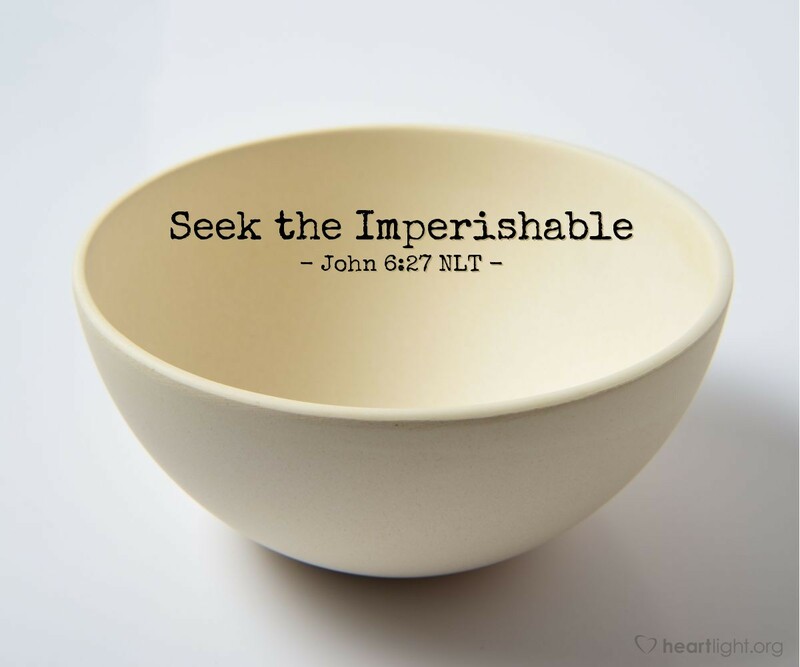 [Jesus said,] "But don't be so concerned about perishable things like food. Spend your energy seeking the eternal life that the Son of Man can give you. For God the Father has given me the seal of his approval." Think about how hard we work and how much money we spend on things that are perishable. Most of what we purchase is subject to decay and destruction. Think of all the effort and energy we put into gaining fame and fortune when those things are fleeting, but faith and family endure. Life is found in Jesus; he is its source, purpose, and destination. Let's not forget that. Most other things eventually deplete our lives. Only Jesus gives us life that is both lasting and meaningful. God, please give me the wisdom to know what is important and what isn't. Help me use my time and my influence wisely. Give me the courage to choose the right thing over the acceptable thing. Give me the passion to invest myself in what is most important to you. In Jesus' name, I pray. Amen.